It’s the little things that are big things to kids. But as parents, sometimes we can tend to focus too much on the big picture, on the possibilities, on the future. From this day forth, I’ll cherish it all. The poem really makes me reflect on how I want to help shape my children’s memories, and who I want to be when I’m with them. What do you remember about your own parents? What are the activities, sounds, smells and tastes that bring your favourite childhood memories back? These are the types of activities that get forgotten when we are overscheduled, overworked, and spend too much time on our devices. Often it’s the simple things, the little things that kids cherish and will hold onto in years to come. I have put together a list of top five things I love doing with my kids, to remind myself of what to focus on when it comes to spending time and making memories with them. 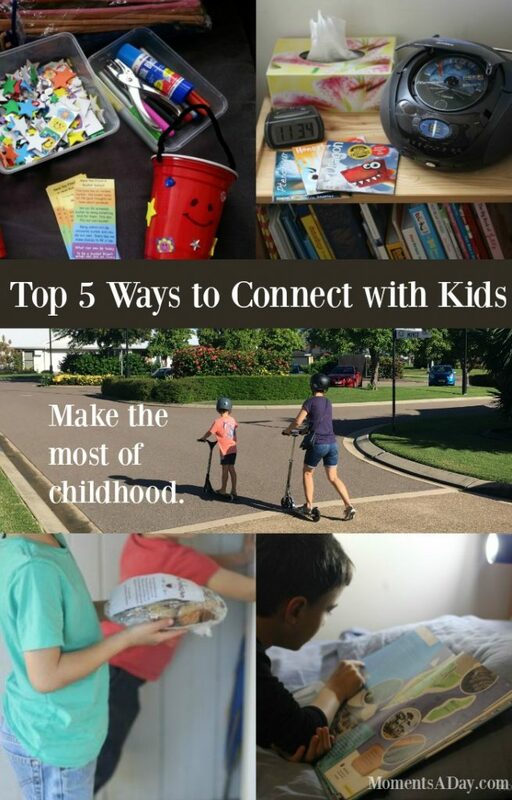 Connected parenting is not about making something look Pinterest-worthy or going over-the-top to entertain the kids, and more about getting down the basics and enjoying life together. Nature is good for everyone. Being out in the fresh air, soaking in Vitamin D from the sun, and appreciating the earth’s incredible beauty. There are so many things to do outside, too… from hiking to kicking a ball around to searching for treasures to watching the clouds float by. Thanks to Micro, I now have an adult scooter to ride, and it has been a hit during our family’s outside time! My boys absolutely love that I am trying out something they enjoy doing. They have been scooter lovers for years now and, since I never had one growing up, I had actually never given it a go! It is so much fun to explore new places and get active together, I highly recommend getting one if you want to enjoy some scooting adventures with your kids. #2 Listen to music/audio stories. Music can really cheer me up (and relieve stress! ), and from experience I have learned that it makes a difference to everyone else in my family to play uplifting songs that we can sing along or dance along to. We also love listening to audio stories and guided meditation CDs. Everyone always feels better (and more connected) after we listen together. I’m not an especially crafty person, but I do enjoy making things and sharing creative experiences with my children. Using whatever craft supplies we have at home and occasionally enjoying a craft kit from the shop gives us a really fun way to make memories together. Whether we are cutting paper snowflakes or drawing mandalas with sidewalk chalk, just being free and creative is what it’s all about. I love to see what my kids make and how much joy it brings them. Measuring ingredients, pouring, mixing, and spooning out… waiting for the timer to go off… and taking out a perfectly yummy dish out of the oven. Baking is simply magical! I remember looking up to my own mother and being awed by what she could create in the kitchen, and it is amazing to experience being on the other side of those eyes now that I am the parent my kids are looking up to. I’m not a master baker by any means, but I know my kids’ favourite recipes and it is really special to be able to provide a delicious treat we can make and enjoy together. From board books to storybooks to chapter books, reading is relaxing and educational at the same time – what more could parents want! At the end of the day, I want to inspire my kids to feel connected to me and know that I care about their interests, and reading together ticks easily both the boxes. What would you add to the list? What are your favourite childhood memories that you want to relive with your own kids? I was sent a scooter from Microscooter in order to review it. All opinions are my own. To read more about sponsorship on my website, visit this page. Love the suggestions (some of our favorites!) and the thought behind them. It’s so important to realize the importance of those “little” things and do what we can to embrace that. Thank you for sharing the beautiful poem, we love embracing parenthood and childhood in this slowed down, filled up, taking-it-all-in kind of style.